Ranked No. 47 in the world, the irrepressible 20-year-old became the first Latvian to snare a major with a 4-6 6-4 6-3 success. 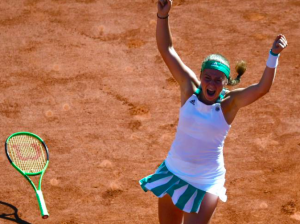 Gunning winners from both wings, Ostapenko is the youngest Roland Garros champion since Croat Iva Majoli (19 years and 300 days) in 1997. “I think I cannot believe I am the Roland Garros champion and I’m only 20 years of age,” Ostapenko said. “I have no words. It was my dream. I’m really, really happy. “I knew that Simona is a great player. I was just trying to fight for every point even when I was down 6-4 0-3 and again in the third set at 1-3. Simona Halep dominated early but couldn’t finish the game off. Contesting only her eighth major, Ostapenko clubbed 54 winners to Halep’s eight, while committing 54 unforced errors to the Romanian’s 10. And she saved 10 of 16 break points — some when the contest hung in the balance. Remarkably, Ostapenko had never won a title until now. The stocky baseliner is the first unseeded champion in the professional era. 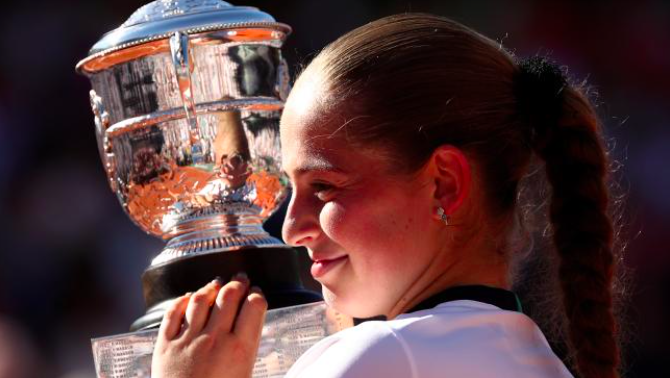 The last player to lift the French Open as their first crown was Brazil’s Gustavo Kuerten in 1997 — on the same day Ostapenko was born. Seemingly destined for defeat, Ostapenko had to do it the hard way. She won the 2014 Wimbledon juniors. 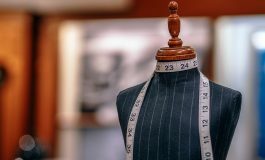 She pursued ballroom dancing and contested the Latvian national championships before deciding to concentrate on tennis. Her father Evgenijs is a former professional footballer. Her mother Jelena used to be Ostapenko’s coach. 6 – Ostapenko prefers to be called Alona. Her tennis idols are Serena Williams and fellow Latvian Ernests Gulbis. She was born in Riga on June 8, 1997 – the same day Gustavo Kuerten won his first professional title by winning the French Open, the same feat Ostapenko has now achieved. Ranked No 47 pre-tournament, Ostapenko will climb now to No 12. Until Roland Garros, Ostapenko was best known outside of Latvia as a racquet-throwing villain after an incident in Auckland in January, when she almost hit a ball boy. Trailing 0-3 in the second set and 1-3 in the deciding set, she mentally regrouped in the biggest match of her short career to clamber back on terms. And then she roared away. One of the pivotal moments in the match came in the seventh game of the third set when Ostapenko rifled a backhand down the line. The ball was tracking wide but clattered into the net, ballooned high into the air and landed in for an improbable winner — and break of service. A simple equation was widely expected to decide the final — the Ostapenko winners to unforced error tallies would tell the tale. She thumped 14 winners to Halep’s one in the first set, but committed 23 unforced errors to two — and paid the price for her relentless aggression. Behind after 39 minutes, Ostapenko showed no inclination to temper her approach. Bombarding Halep from the back-court, Ostapenko continued to land winners — but even more unforced errors and quickly lapsed to 0-3 (0-40). Staving off more break points in the fourth and sixth games, the Latvian firebrand suddenly exploded to win six of the next seven games to level the match. She was in similarly desperate straits in the third set when 1-3 in arrears. Again refusing to rein in her aggression, Ostapenko stormed through the final five games — seemingly breaking Halep at will. Ostapenko will rise to a career-high mark of No 1 while Halep is left to reflect on her second runners-up finish in Paris after defeat to Maria Sharapova in 2014. 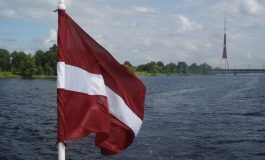 Next article Let's enjoy the summer: festivals to visit in Latvia!